US, 1995, 91 minutes, Colour. 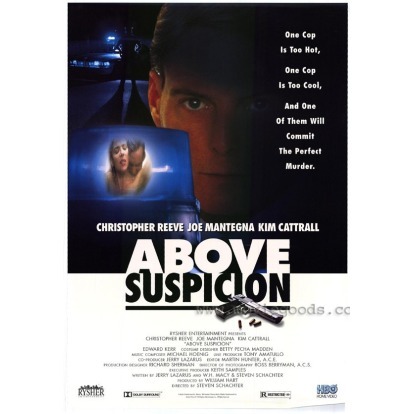 Christopher Reeve, Joe Mantegna, Kim Cattrall, Edward Kerr, William H. Macy. Above Suspicion is the story of an exemplary policeman, a perfectionist in all things. Injured in a shooting in a police raid, he is confined to his home and seems to be brooding. He then arranges with his brother and his wife to organise the pretence of a robbery so that he can be shot and killed, and they will get the insurance to guarantee the future of his child. However, the brother and the wife having been carrying on an affair. As it emerges, the whole thing is a set-up so that he can get revenge on his brother and his wife. While he has arranged everything seemingly perfectly, one of his police colleagues is suspicious and pursues the investigation despite protests from higher authorities. When it goes to a hearing, he again is unable to make charges against the policeman and has to move away to California while the policeman is able to enjoy the success of his perfect revenge. The perfect policeman is played by Christopher Reeve - a very short time before his tragic accident. It is sad seeing him in a wheelchair, even though paraplegic, and thinking that soon after he was to become quadriplegic. Kim Cattrall is the sensual wife. Joe Mantegna the relentless policeman who pursues him. William H. Macy is the prosecutor and contributed to the screenplay with director Steven Schachter, as he did with a number of films. 1. A police drama? Perfect crime? 2. The locations, the police settings, the streets and the drug addicts, criminals? Homes, affluence? The police stations, the courts? An authentic atmosphere? Musical score? The credibility of the plot, the perfect policeman, his perfect revenge, the perfect crime - his mistakes, being able to cover them up, higher authorities not suspicious of him? The relentlessness of Rheinhart and his ultimate defeat? 3. The title, the perfect policeman and not a suspicion of doubt? The irony of the truth? 4. Dempsey, his work as a policeman, his skills, promotion, his being regarded well by authorities and his partners? The shoot-out: his being injured, his decorations, honours? His recuperation, his brooding? The perfect policeman, the perfect family? His reliance on his brother, supporting him even when his brother made mistakes? His asking his wife and brother to set up the robbery in order to kill him so that they can get the insurance? Their hesitations, their agreement? The plans for getting the gun, using his criminal contacts? The night itself, the car, the gun, the entry into the house? The reality of his confronting them with their adultery, his killing them both? His covering up, the arrival of the police? Sympathy towards him? The evidence and the clarity of the break-in? His success, the interrogations by Rheinhart, the possibility of his being indicted, the authorities and their anger with Rheinhart, the hearing of the evidence, the possibilities with the aim of the bullets, the ornaments in the house - and Dempsey always having an answer? His being vindicated, Rheinhart having to leave town? Crime paying? 5. Dempsey's wife and brother, their relationship? His wife at home, the child, pretences? Her supporting him? Her going to see his brother? The shooting, her response? The plan, her revulsion? The tables turned and her death? His brother, always looking up to his older brother, his being a loser, his always being saved by Dempsey? His betrayal? His agreement to the plan, his death? 6. Rheinhart, second-in-charge, partner? Admiring Dempsey but wary of him and his perfection? His own work, the investigation of the break-in? His suspicions, his alertness to clues, his return for explanations, questions? The audience knowing he was right and their exasperation at the authorities thinking that Dempsey was above suspicion? Rheinhart, drinking, following Dempsey, asking him about clues, angles of bullets etc? His not being able to prove his case? 7. A psychological study, the perfect street angel, house devil? The arrogance of the person above suspicion, acting in a "God-like" way? Making judgments on others, executing his judgments?